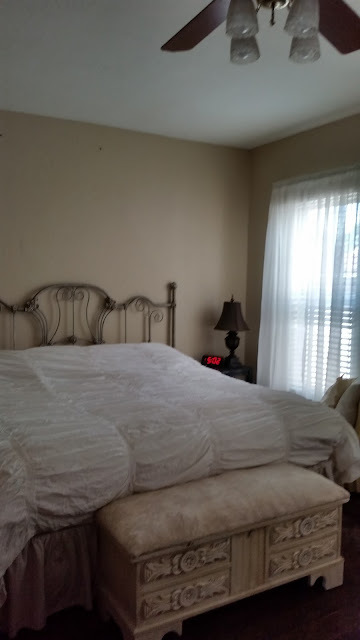 Please overlook the yucky "beige" on the walls from 12 yrs ago! I was a bit of "Shabby Chic" nut for 20 plus years. 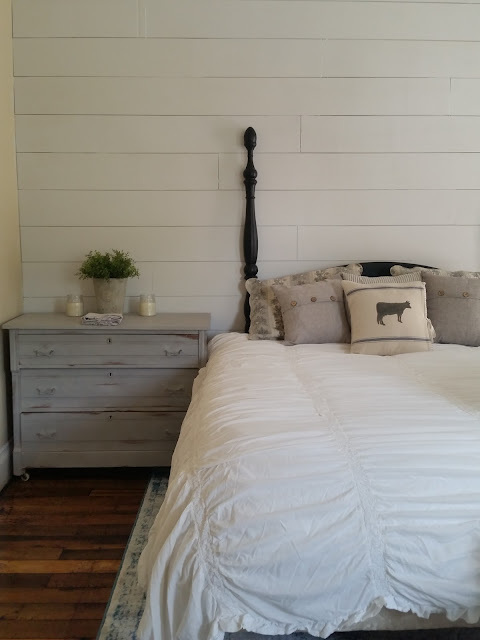 That was until I saw a few episodes of Miss Joanna Gaines HGTV's Fixer Upper and Omg! I want it everywhere!!! Of course with my own spin of grey and soft blue accents but, mostly black and white with wood. Yummo! Lol! Reading in bed one night, I all of a sudden jump up and declare "Honey! that's a brick chimney under that plaster, isn't it?" Although he'd usually only see this as more work for his-self, I actually got a Omg! I think that's brilliant kinda, light bulb went off look! Lol! Whew! Immediately the next day I did a tester spot and the rest although a huge mess is history! I'm completely in love with this look and couldn't happier with where this is going! The shiplap can't go up fast enough and I'm now scrambling for curtains, bedding and what furniture I already have can be painted to go in here? 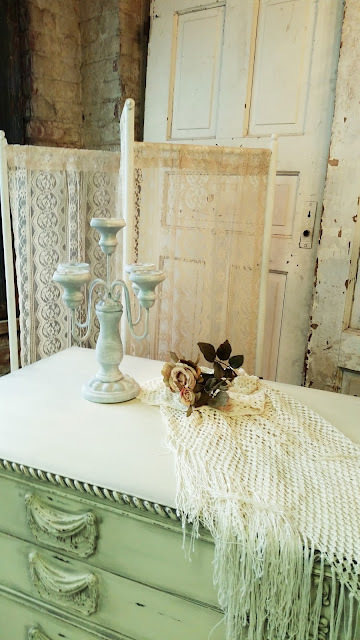 I did get a jump start and found this beautiful rug already! I'll share a little bit more about this in another post but, always keep your eyes out for local online sales! They're a Godsend right now for sure! We've only finished the main wall (that our headboard goes on) and the left side of the chimney but, I did get the rest of the shiplap cut yesterday and hopefully will get a coat of varnish on them today. I did manage to get a quick coat of white chalk paint on my favorite antique chest (below) and hubby already had a cute little "Eastlake" style chest (above) on his side in a light grey. The shiplap is sooo much better than the 1940's heavily textured plaster walls. Not to mention it hides a multitude of sins! Finding wood floors after a Decade! Although we've lived in our house for a little over a decade and it's over 100 years old, for some reason we never checked underneath our carpet on the second floor? WHAT you say? I agree! Lol! 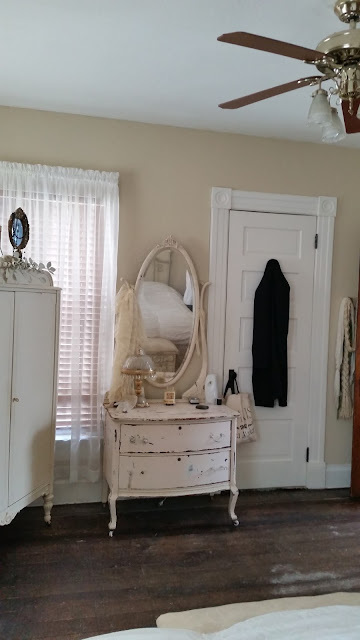 We had checked 3 rooms on the first floor and found that there were hardwoods but, previous owners had lain industrial tile over them and they're probably glued down with that insane heavy black glue that would be a nightmare to get off. After thinking to myself "wonder what's upstairs?" 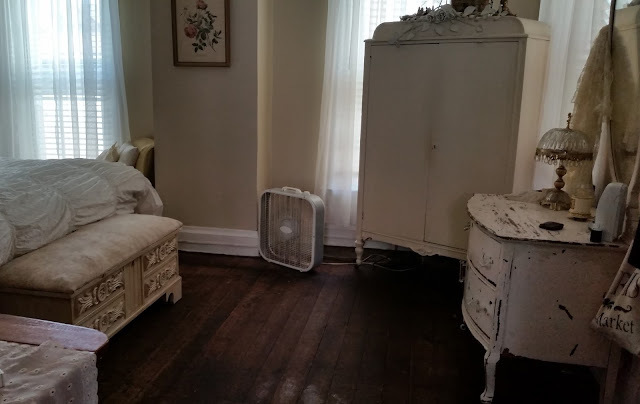 we finally looked and ooh lala was I thrilled to find beautiful hardwoods throughout. So, we started on our room first and slowly we'll tackle the rest. 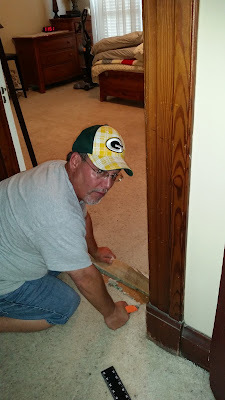 This is my awesome husband Guy carefully cutting a threshold at our doorway! As you can see, there is lovely cream and oatmeal carpet in pretty decent shape. It's all over the house minus the kitchen and baths so, it wasn't a hard decision to keep when we moved in.since most of my French Style decor is creams and whites anyway. 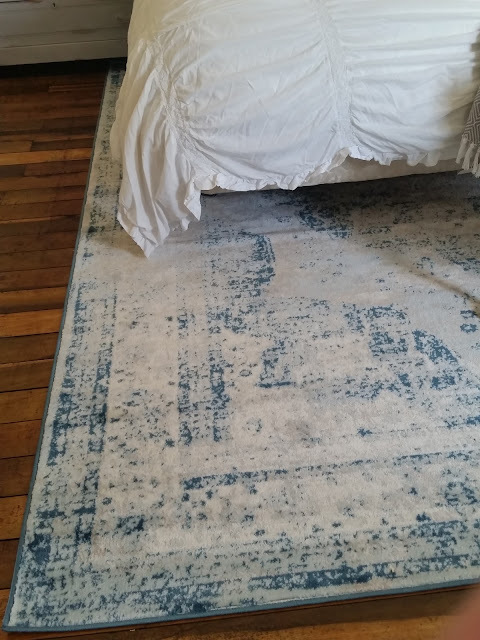 Usually you'll find that orangey color of stain in a house this age so finding this rich dark color underneath was a REAL bonus! 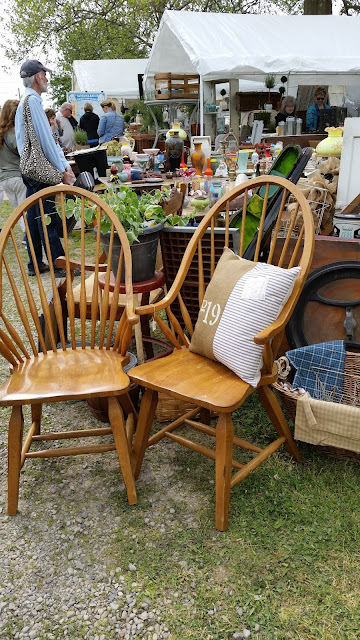 Over the next few months I'm selling most of the pieces you see here and switching them out for more of a "Farmhouse" or "Fixer Upper" style. 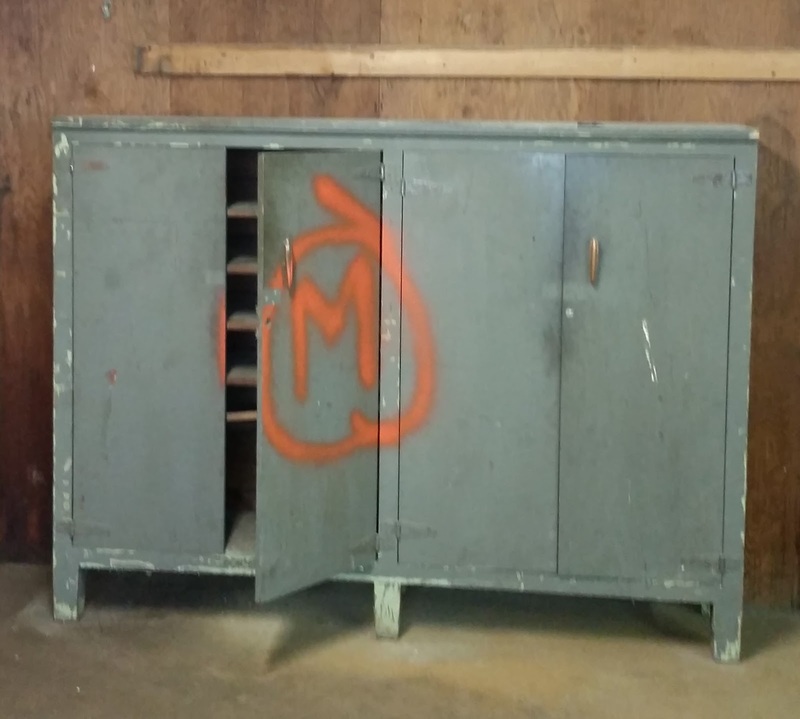 In fact here's a piece we just got that's an old warehouse cabinet I'll be modifying to a double armoire for hubby and I asap! 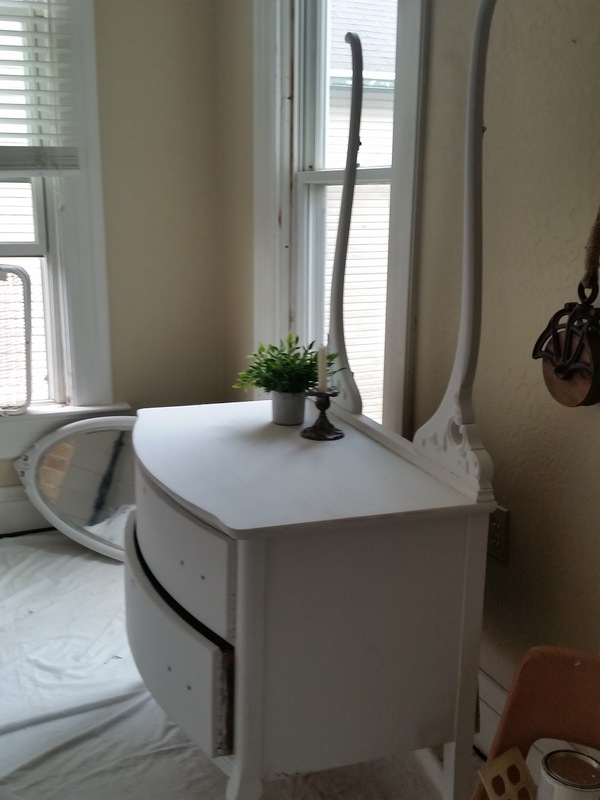 I think a bit of sanding and some chippy white milk paint and it will be gorgeous as well as functional! Thanks for stopping in and make sure to check back to see what else we've added for our Farmhouse Style! It has always been a dream of mine to live in a really old house with lots of character. A decade ago that dream became a reality when we were able to purchase our 3 bedroom 1 1/2 bath home in the Huffman Historic District in Dayton, Ohio. My home was built in 1903 but, my records show my barn was built in 1899. 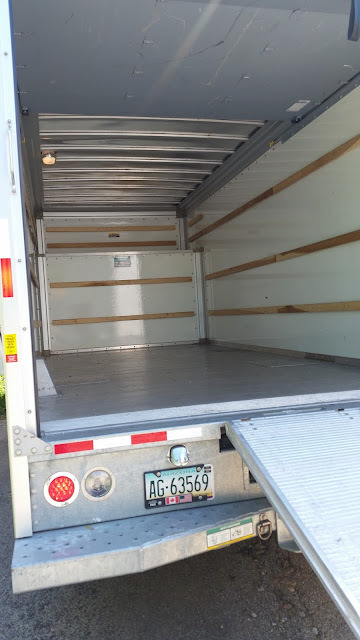 This generally stays packed with furniture and has only once been used over the winter to house a vehicle. Now that I have a pretty good size studio plans are to get it restored to it's intended use Lol! .We salvaged this wrought iron fence from a burned down house around the corner when I talked the bulldozer operator (slipped him a $20) into letting me get it. We love the house and have loved living here but, long for the country where we both grew up. That will be a few more years down the road yet but, is coming! Here's what we start with. We (being super cute hubby and I!) pack it to the gills. Drive 30 min and unload like crazy, then the staging begins. 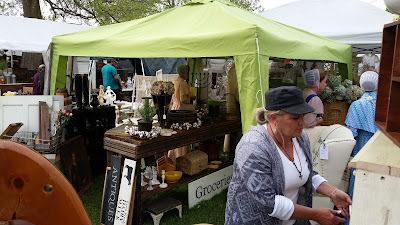 This show I had the help of a new friend and super packer woman Lori Palumbo. Who in the end, I'm not sure I could have done without. 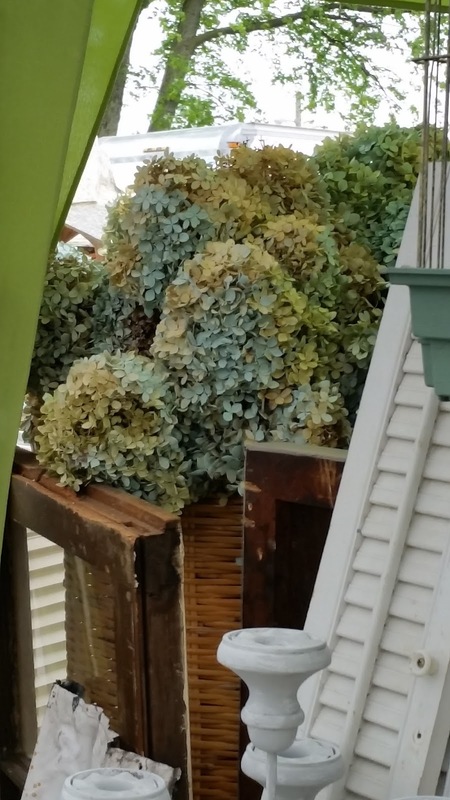 Not to mention, her husband came out at the last second to help unload (Thank you Jeff!) after we arrived late and no porters were available. 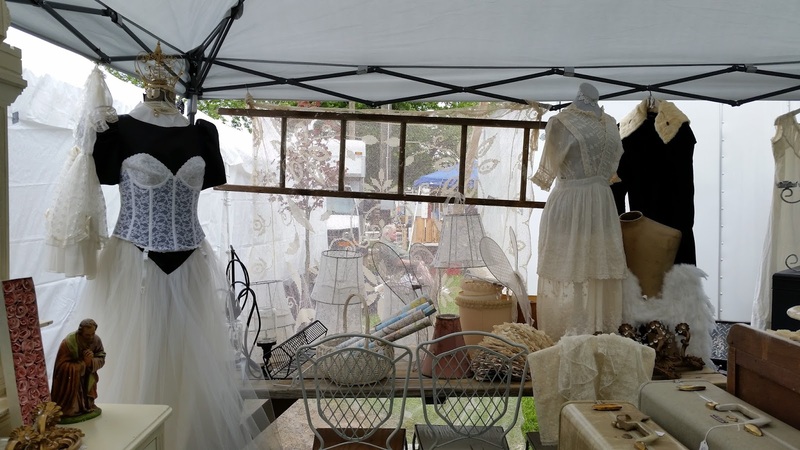 Of course what staging is complete without plenty of dressforms and vintage clothing? 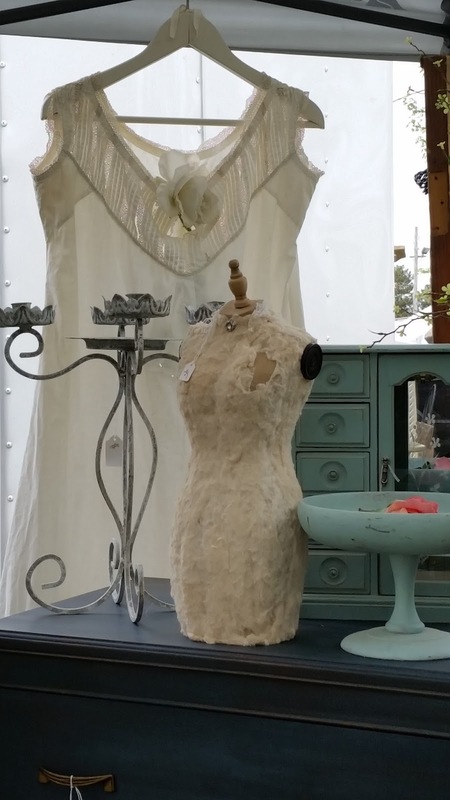 One of my favorite vintage night gowns, (not for sale) not easily found and just right for the "look"! 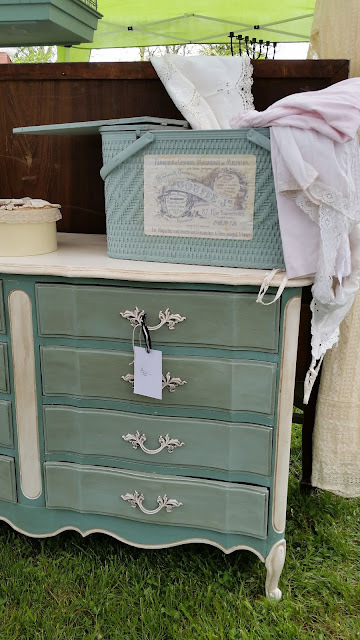 A cute little repurposed cupboard that I built, my sis Jen painted (for the last show) and hubby re-painted for this show. Didn't sell but, might go home with me for a cupboard in the kitchen. Dried Hydrangeas form my own bush and lightly sprayed with a matte paint to tint this beautiful blue. Sold LOTS of them! A French Provencal that will probably be the last of 2 I'll ever have. . I'm in the process of switching over to ALL Farmhouse and want only simply well made antiques or hand built pieces from salvage. Farmhouse Windsors I picked up at the last minute. Only 2 but, will be great "header" chairs for someone! Yep, that's me. Can you believe it was so chilly that I needed a long sweater? Wasn't super crazy about the lime green "pop up" either but, will have to suffice until I can get the white one with the sides I want. It will look much better as a back drop and will protect my pieces as well. You can't beat an old ladder for hanging handmade items on for a show. Plus, they're just plain cool! I hope you enjoyed this little post? Please leave a comment if you like. Like French Country? 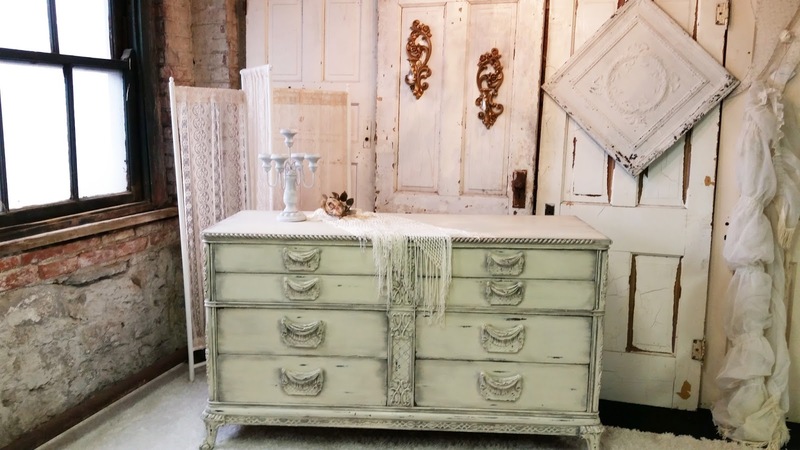 Then you'll LOVE this Ornate Detailed Dresser! I found this piece a few months ago at a tiny little thrift store in a little bitty neighborhood by my house. Unlikely find at this shop. Not much room there. Usually clothing and kitchen items are all I can find. It was actually laying on it's back on a 4-wheel cart on the sidewalk when I drove by but, "something" made me look. At first I thought it was in mint condition but, at closer inspection found that the braided moulding going across the top was broken and missing. It also had a little piece on the left and right that turned up almost like a sleigh bed and one of those were missing completely. 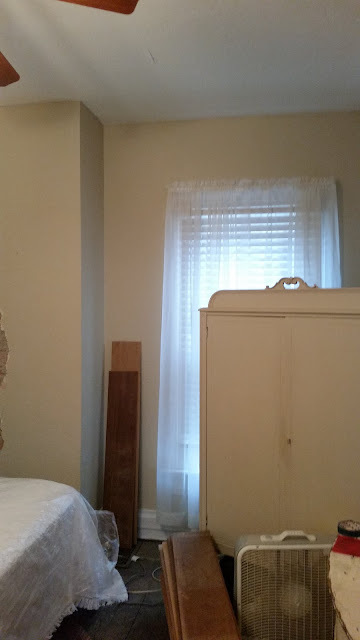 As you can see from the photo, I had a bit of braided moulding in my stash of stashes but, it was new. A good thing I had it but, no way to match it up just right, not to mention the bare spots where I removed the upturned sides. You can just see a little to the R. on the top edge there. 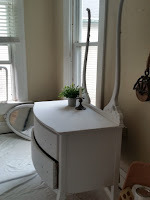 I replaced what I could and although it wouldn't be an exact match (the braiding I had was angled different) I knew that between the added moulding and paint job it would work! I first painted it out in Old White ASCP, gently distressed it and clear wax. Then I waited 2 or 3 weeks before I did the next steps because I knew it needed more but, just couldn't decide WHAT? So, I checked back through my Pinterest pages of gorgeous French Pieces and decided on mixing up a goodly amount of black glaze and tackled it. A word of advice when working with glazes, whatever technique you decide on, make sure you allow enough time to do the entire piece. I've found that coming back later seems to result in a slightly different application and can effect your final result.This is how it turned out! I hope you enjoyed this little post. If you have any questions or comments, feel free to leave them :) I love feedback! Without it, you'll never know what you can do better or how you can help. 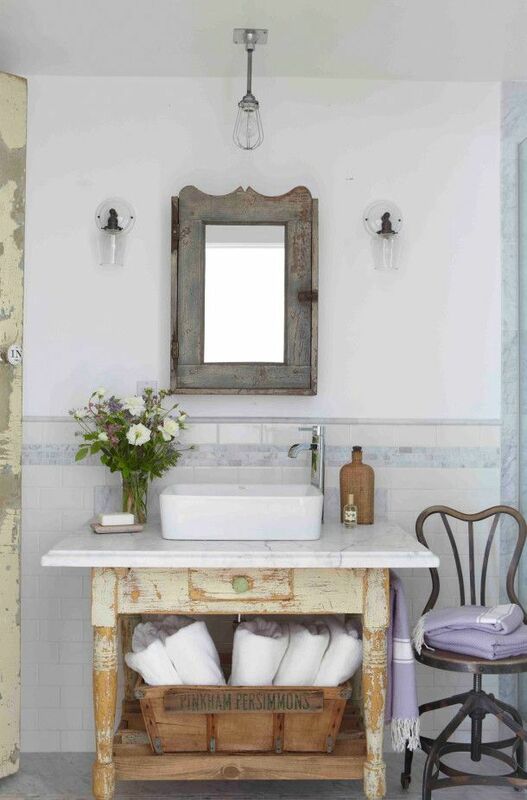 I've always loved the idea of turning an old table or dresser into a vanity. I've seen lots of them all over the internet. Not that so many of you haven't done a fabulous job, because undoubtedly I have seen some gorgeous makeovers! 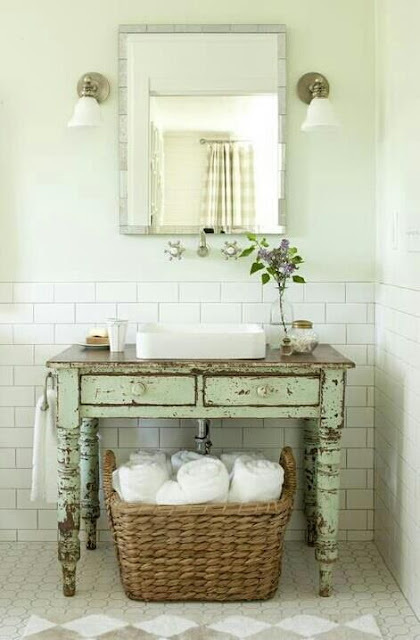 Today I wanted to show you what "I" think is a great Farmhouse Bathroom. Of course it has to be "Chippy" and certainly original paint is the best! So, if I ever DO get to have that piece of land out in the country when hubby and I retire... here are 5 of the most amazing Farmhouse Vanities I have seen so far. 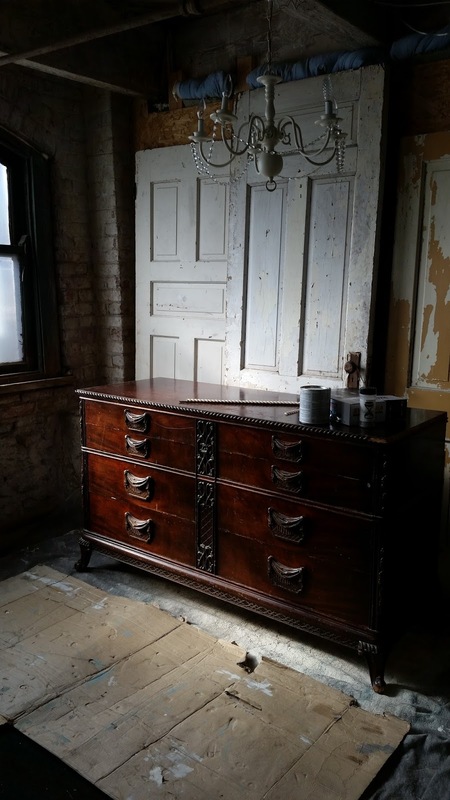 This Edwardian Buffet is great in size, detail and height. 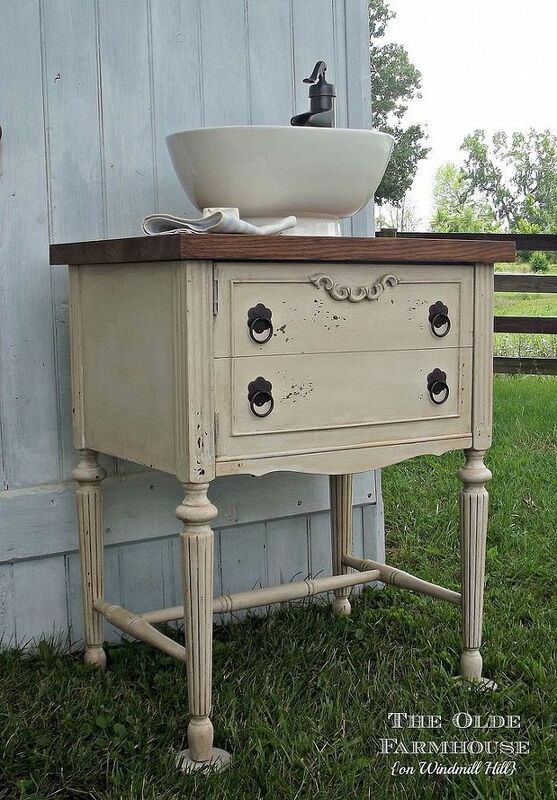 The color is just right for this piece and the fact that it will hold 2 sinks instead of 1 is even better! 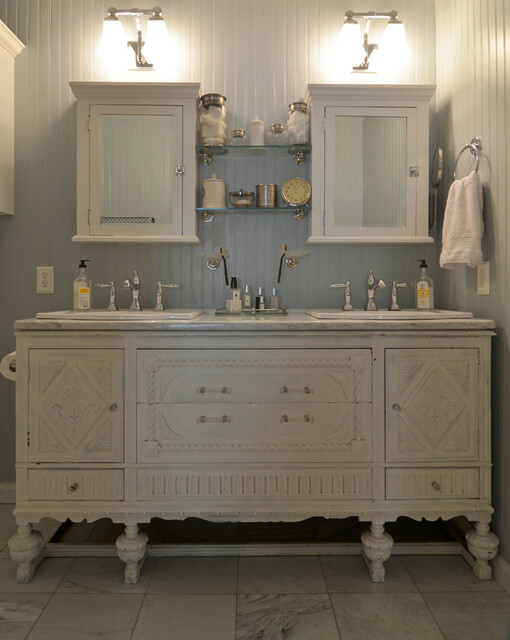 I love, the soft grey beadboard behind it and the carrara marble tile does nothing but, polish off the whole setting. 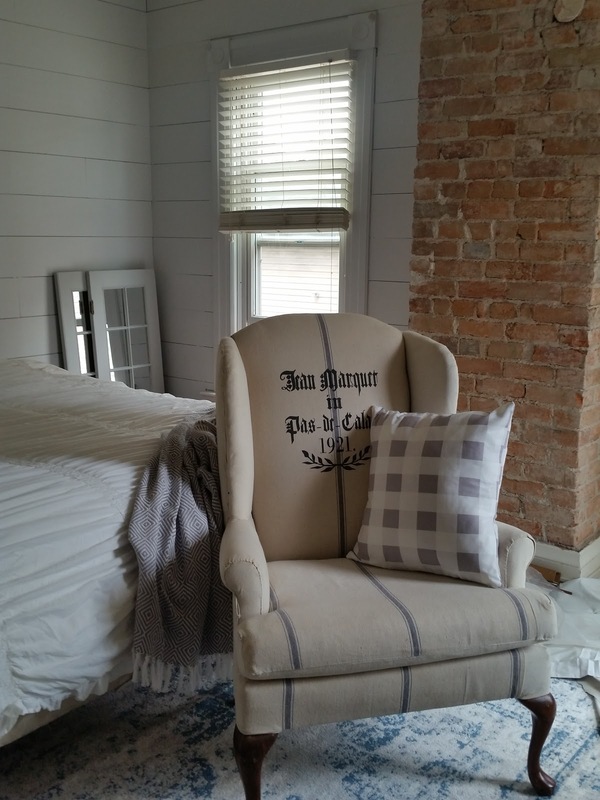 Perfect "French Country" Farmhouse in my book! This would be perfect in a small space. I can see this anywhere from a lavatory to a public ladies room in a shop to a small closet space in a bed and breakfast. This of course would mean I would need 2 Farmhouse vanities and I definitely wouldn't be hating that! Lol! 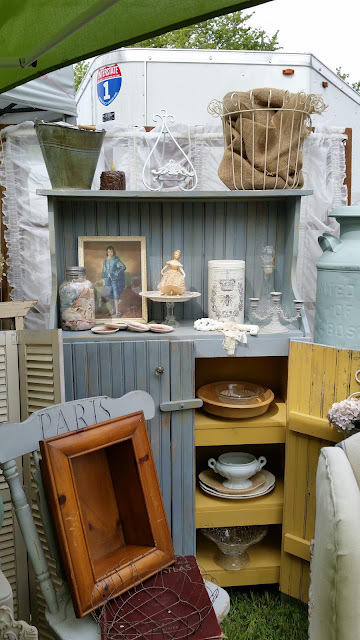 This sunshine or mustard yellow can easily be achieved using my VERY favorite milk paint Miss Mustardseed's Milk Paint in her all famous "Mustard Seed Yellow"! I love that the top was refinished and the sink is offset with that lovely rubbed bronze faucet. 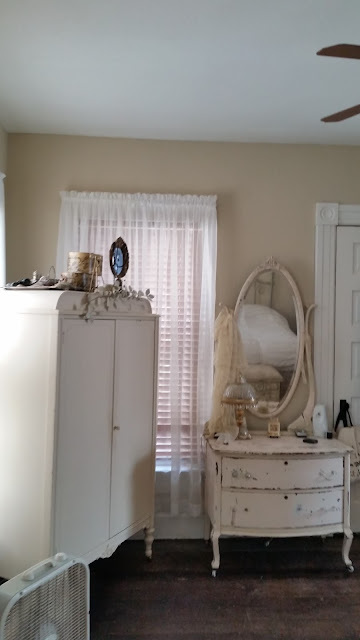 Notice the shelf on the bottom (great idea for storing towels) was refinished as well to match the top. Great job! This is just fabulous! Does that Gal have a pair of legs or what? 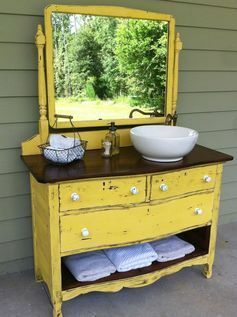 The "Chippy" original paint, the added fruit basket for towels, the chippy paint on the door and the raw barn wood on the medicine cabinet are all great finds placed together for one fabulous look! Not too many accessories and just a touch of lavender in the flower arrangement and the towels/scarves are just the right touch here. I have to mention the antique bankers chair as well....it speaks for itself! As I do usually save the best for last, this is MY favorite out of the five! I would normally use all white shades in any home I have but, this green is so subtle and so perfectly "Chippy" I would probably hurt somebody to get to this! Lol! The legs are exactly what I think of when I picture a great Farmhouse table. In fact I look for legs like this to build Farmhouse Dining Tables everywhere I go. 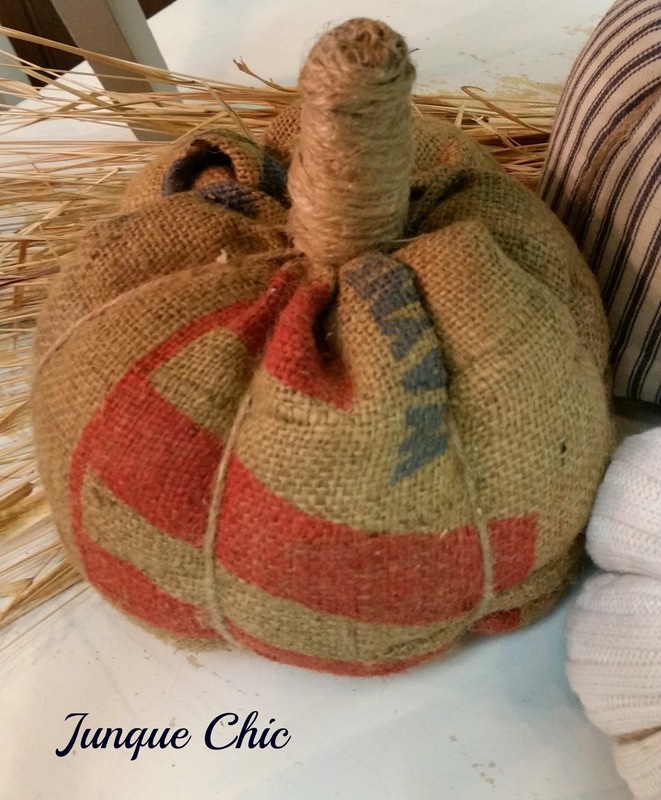 They're extremely hard to find and an absolute must if you want that "Farmhouse" look! 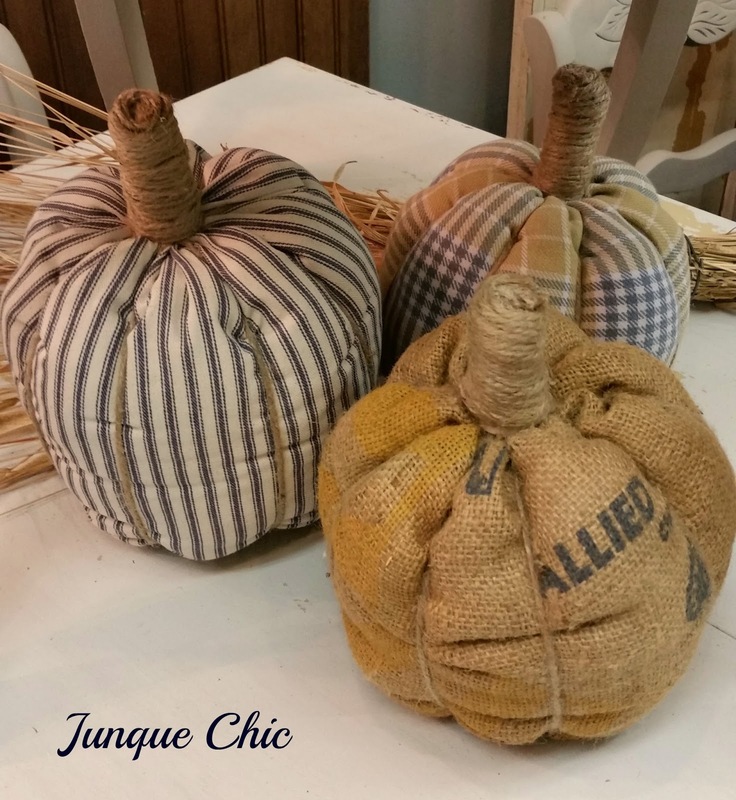 I hope you enjoyed this post and Thank you for stopping by Junque Chic! introduced me to a fabulous show, I'm sure you've heard of it? "Fixer Upper" on HGTV. This style is not only HOT right now but, gorgeous and I'm sure will be around for quite some time. 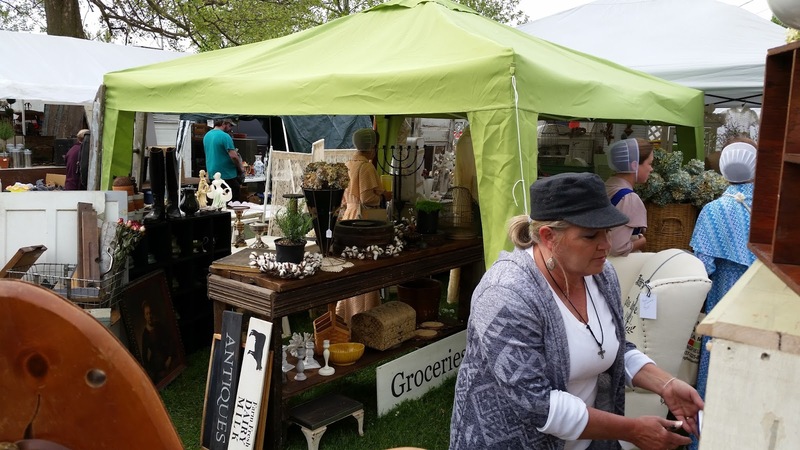 It's both rustic and vintage and appeals to a large audience. Where both men and women are enjoying decorating their home together. Here are a few of my standby's made out of chenille. Most of them have added vintage or antique doilies and a piece of jewelry but, some were just left plain. As the years have passed it seems a "less is more" approach is best on most things that I do. 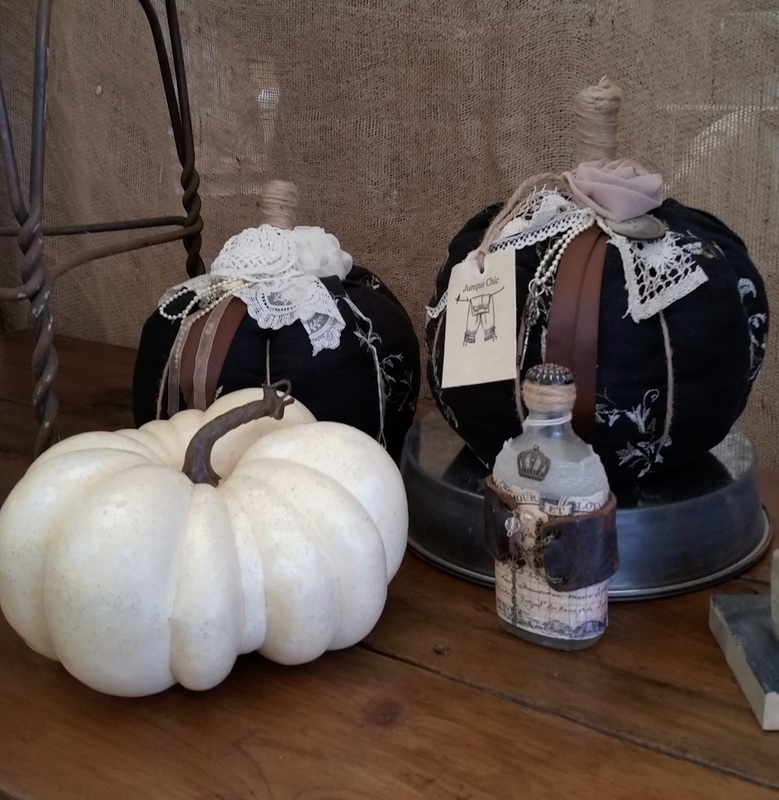 Here are a few of made out of a black linen with raised embroidery, added jewelry and handmade roses. Although the very first pumpkins I ever made were out of sweaters, it's only this year that I've come back full circle to not only sweater but, some gorgeous feed sack's that I found while on the Longest Yard Sale with my sisters in August. The colors were amazing and because I just love an eclectic mix when I'm doing a vignette of anything, I was inspired to add navy and white ticking for a little variety. One of the feed sack's had navy and mustard on it so, when I saw a lovely yellow and navy plaid flannel at the local GW, I grabbed it. I could only salvage one pumpkin out of the size med flannel but, it makes a perfect contrast to rest of them! 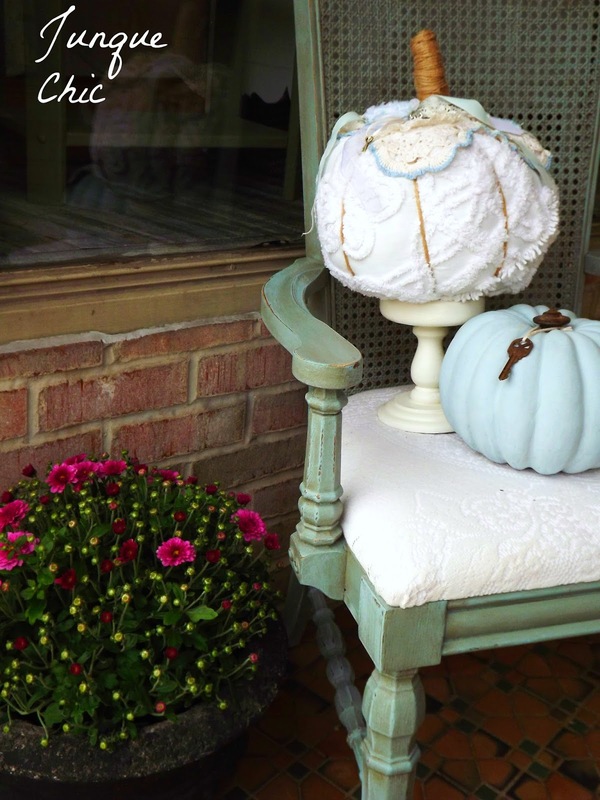 The painted pumpkin belongs to me and just seems to work great for pictures no matter what I put it with. 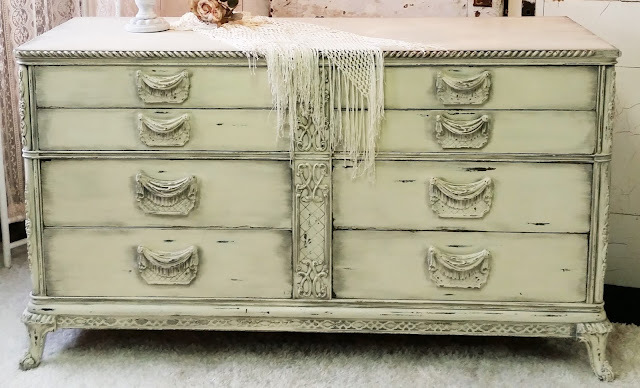 I used "Shutter Grey" by Miss Mustard Seed line of milk paint. Added an old key and a cabinet knob for a stem. 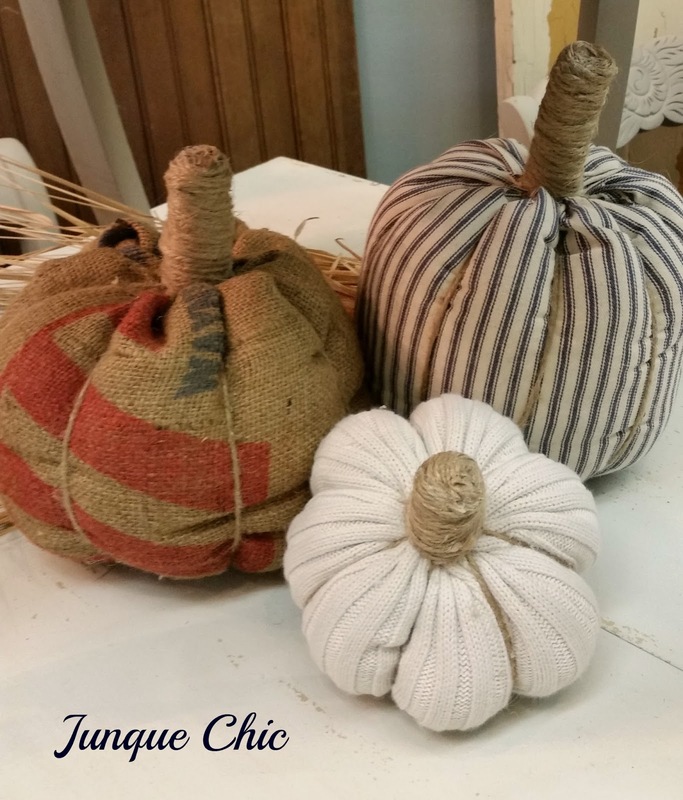 This year's pumpkins will be available on Etsy over the next few days! 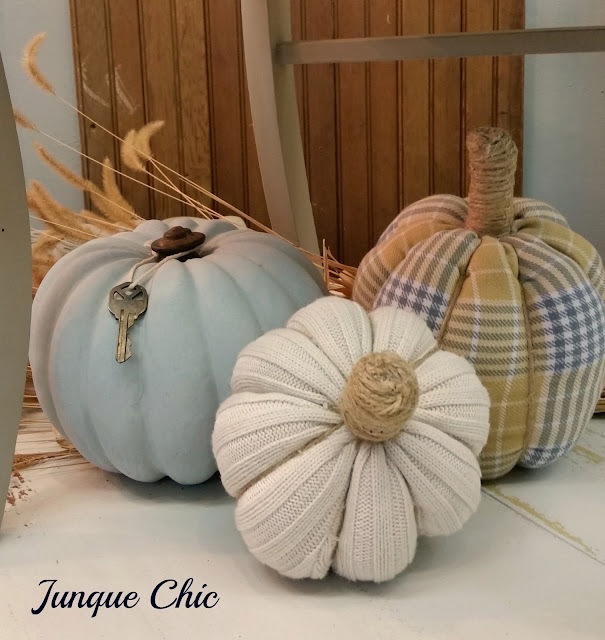 Thank you for stopping by and Happy Fall Y'all!